Months later, on January 19, 2019, Ms-Lecter contacted Amalgrim about retrading the kebanzu. 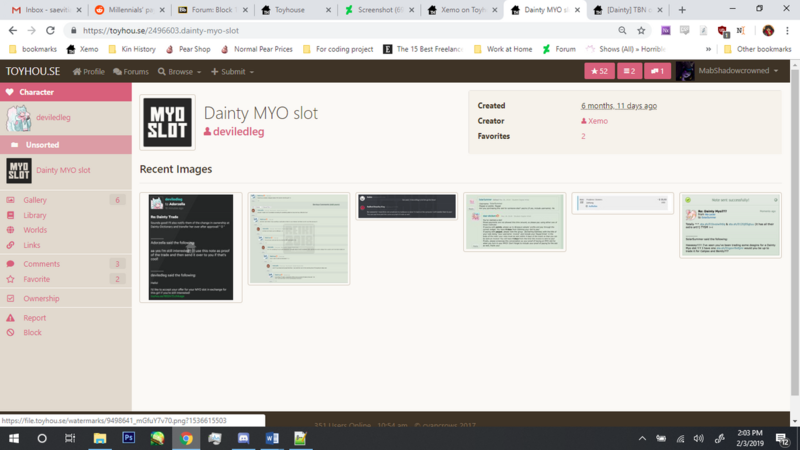 Her offer was 3 pre-tracker Dainty MYO slots, all of which appeared to be from huge, unlimited MYO slot events (2 from February 25, 2018, 1 from May 18th, 2018, both journals containing well over 1,000 comments each), to which Amalgrim accepted. Seeing how smoothly the previous transaction with Ms-Lecter went, Amalgrim thought that there little reason to think that she was going to scam him, and thought the over-payment in Dainty slots was due to seller's remorse. A few days later, on January 25th, 2019, Amalgrim thought to gift Sinnoh, one of the slots from the trade, as thanks for doing design works for him and his husband. However, after Sinnoh noticed a discrepancy in the slot's payment proof that was given to them, as well as being unable to find the original claim comment on the journal that it was for, Sinnoh took to noting the Dainty group about the legitimacy of the slot. A Dainty moderator, Mollygoma, responded and confirmed that the slot was indeed fabricated. She cites that the claim comment was heavily edited, among other details such as the wrong payment price. With this brought to light, Amalgrim allowed Sinnoh to also look at the other slot proofs that he had received from this trade (remember, he was offered 3 in total). 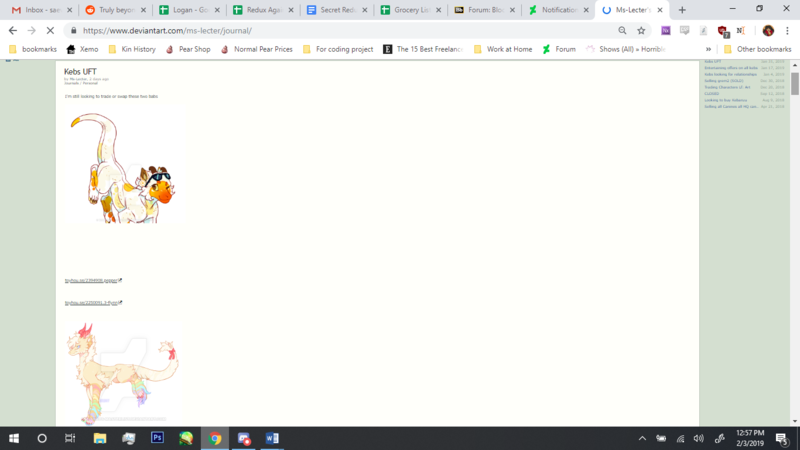 It was at this point that I (MabShadowcrowned/Queenofblackcrows) joined in to help investigate and find more information. As it turns out, that wasn't the end of the problem, because upon closer inspection and digging of the other proofs that Ms-Lecter offered for the trade, a similar pattern began to emerged: none of the original slot claims could be found on the event journals that they were supposed to be from, as it was with the first confirmed fake slot. Even if it was true that SolarSummers changed their name to SolarSummer, as it was claimed, one look at SolarSummer's activity is enough to show that it's clearly not the case. That wasn't the end of the problem either. Now, not only were all 3 slots fake, what with there being no real slot claims to begin from any of the users presented in those screenshots, but there is also now conclusive evidence that Ms-Lecter is complicit in this scam, if not the sole perpetrator. Looking back to the first slot's proofs, there was another huge discrepancy in the trade notes between the original "claimer", CalistaBerry, and SolarSummer, the person who then allegedly traded the slot to Ms-Lecter. Note how the top says that the note is a conversation between CalistaBerry and SolarSummer, but in the body of the note, it's clear that the conversation was actually happening between SolarSummer... and Ms-Lecter. It is clear that both of those screenshots are actually taken from Ms-Lecter's inbox, but only with her name edited in the To/From header. These slots were eventually then "traded" BACK to Ms-Lecter, despite it being clear that Ms-Lecter "offered" those same slots to begin with. 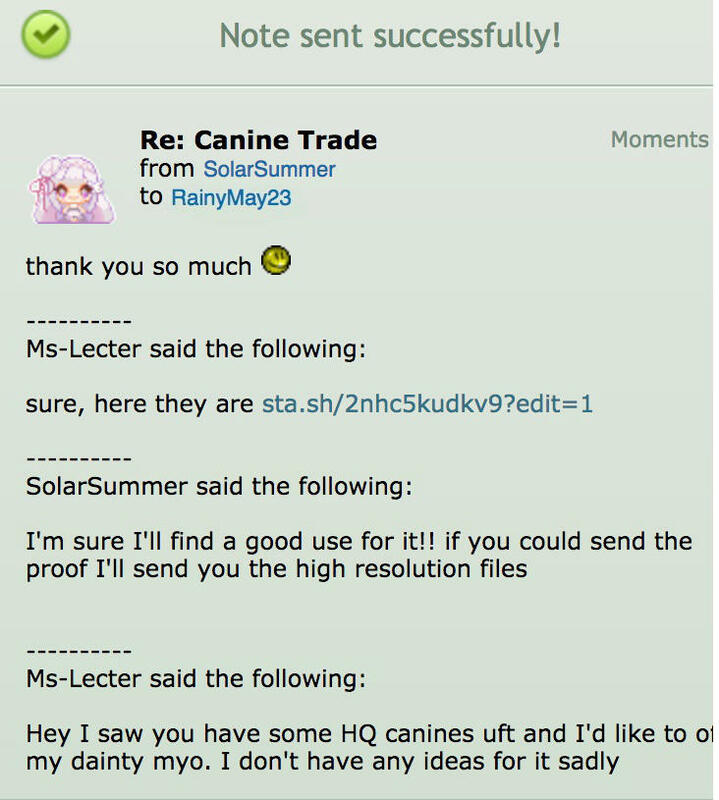 It's no stretch to imagine that those trade conversations were completely staged to make it look like several slots from different people were being traded around, with Ms-Lecter being the one to talk back and forth with herself, and that SolarSummer is actually a dummy account made to look like a different person. If Ms-Lecter was truly innocent, and SolarSummer was the true culprit, it would've been nearly impossible for Ms-Lecter to not realize that something was up with the proofs, especially when it's clear that she was the one screenshotting these "proofs" from her inbox. 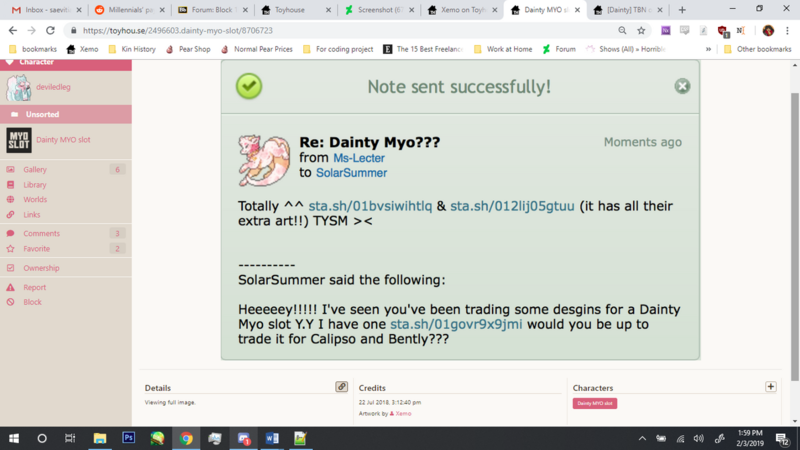 After all, her name is somehow plastered all over the trade conversations that SolarSummer allegedly had with other people, which she herself should've been able to call foul, and yet she uploaded them onto her Stash and traded them out with the intention to scam. 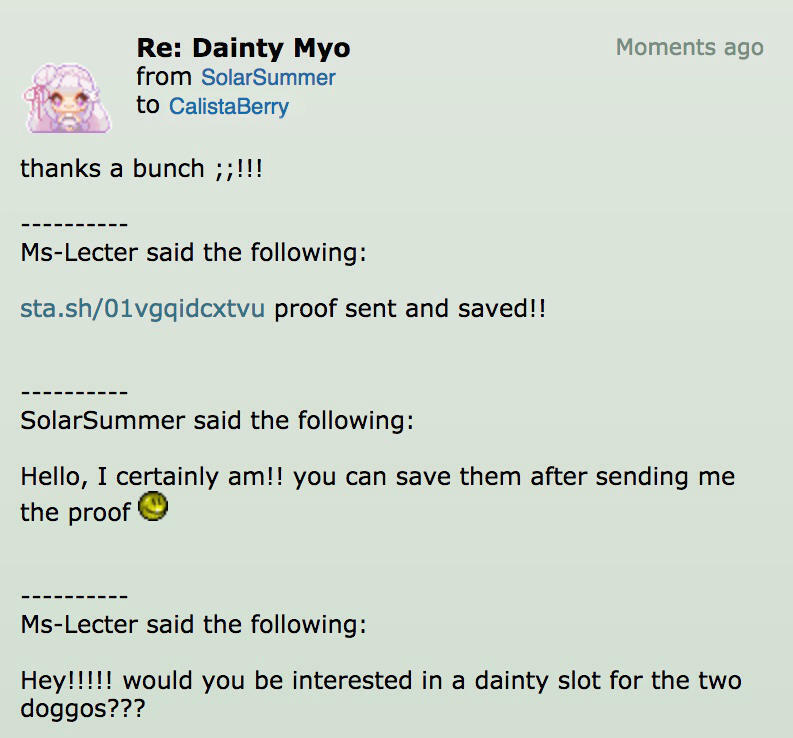 Even if SolarSummer does turn out to be a different person who happened to be in league with Ms-Lecter, it does not absolve Ms-Lecter of her responsibility, as she still saved these screenshots into her own Stash, and knowingly offered the falsified slots to Amalgrim; even if given the benefit of the doubt, at the very best, the situation still makes Ms-Lecter look like an accomplice. She knew what she was doing. Hauket, the owner of the Kebanzu species has been made aware of the matter, and acknowledged its severity. He said he would speak to Ms-Lecter/Xemo and appears to have done so as Xemo issued the following apology to Amalgrim, and reversed the trade. However this apology does not address either the fact that Lecter/Xemo previously scammed others with fake dainty slots (addressed in next post), or the fact that they immediately turned around and tried to sell/trade the adoptable that they supposedly 'regretted trading' immediately. That is the matter as it stands. This thread will be updated with more information in a following post. -Amalgrim bought Ms-Lecter's kebanzu months ago. Ms-Lecter wanted the kebanzu back and offered 3 fake Dainty MYO slots, scamming Amalgrim. -Amalgrim wanted to be nice and gift a slot, not knowing it was fake; a Dainty mod confirmed that the slot was fake when asked about legitimacy. -Looking at the other slot proofs, it was discovered that none of the original claims existed in the MYO event journals they were for, and that one claimer never seemed to have existed at all. Therefore, all 3 slots from Ms-Lecter were 100% fake. -Looking again at the proofs, it was found that Ms-Lecter was spoofing trade notes between the "claimers" and SolarSummer, a dummy account, but forgot to edit out her own damn name in the body of the notes, linking her as the one responsible for this scam. -Ms-Lecter/Xemo has been contacted and 'apologized' for some of their behavior but not all. -Ms-Lecter/Xemo has previously scammed others with fake dainties which will be addressed in the next post. As noted in the prior post, this is not the first time that Xemo/Ms-lecter traded illigitimate dainty slots. Both of these slots are supposedly from the May 18th unlimited Dainty MYO event. 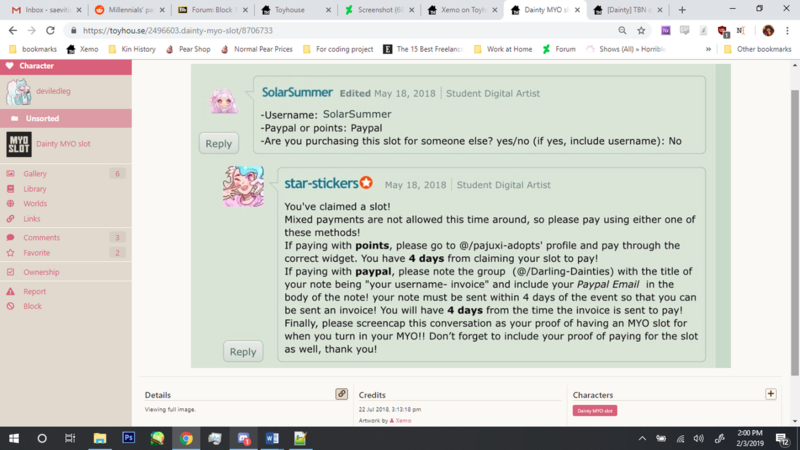 However it is easy to see if you actually go through all 12 pages of the event here: https://www.deviantart.com/darling-dainties/journal/2-HOUR-DAINTY-MYO-EVENT-CLOSED-745542216 that no such claims by SolarSummer actually exist. Thus, these slots are both fabricated. Both slots changed hands multiple times after their creation by Xemo. The current owners are being alerted to the issue. NOTE: I think this goes without saying but please do not harass anyone who may have owned these fake slots or been scammed by them. Please also don't harass the scammer. Just don't harass people in general. Thank you so much for making such an in-depth post! 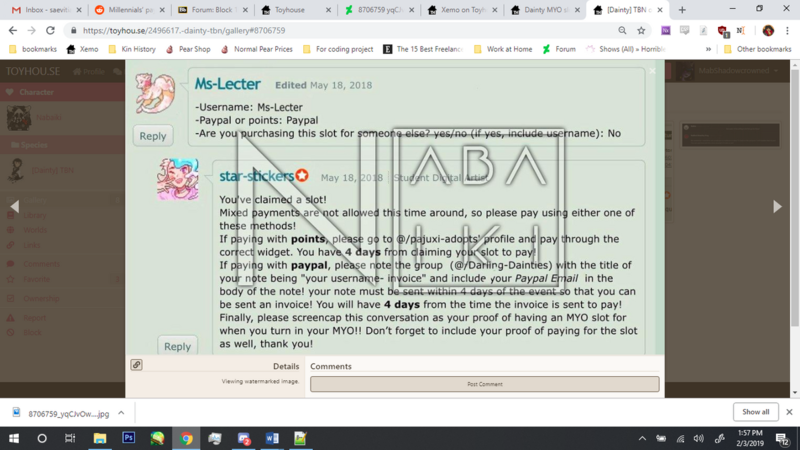 We will be posting a warning about Ms-Lecter now that its confirmed that they originated these fake slots (as the other accounts deactivated before anything could be done) as well as working with the people who unfortunately got traded these slots- obviously none of this is their fault so nothing will be taken away/ we will be working out solutions catered to individual situations. Thank you so much for addressing this so quickly! You are awesome. So sorry that this has been a repeat issue! 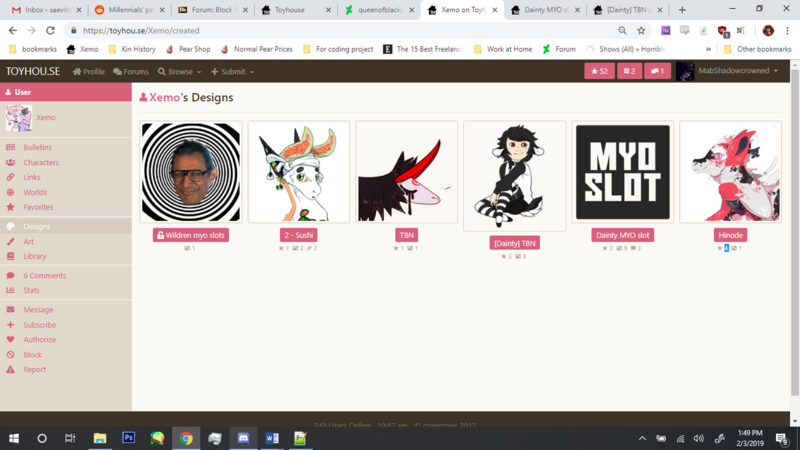 WHA- thEY FOLLOW ME ON DA THAT'S SCARY. Thank you SO much for letting me know about this user. I have now blocked them entirely because this is FRICKIN DISGUSTING BEHAVIOR. 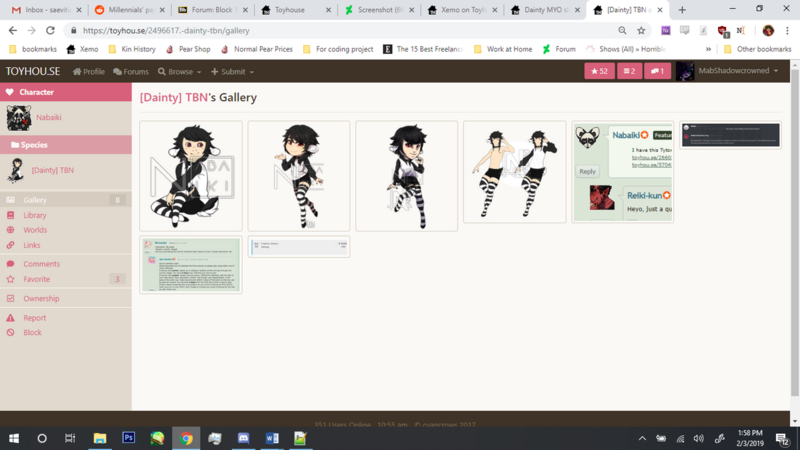 I sell a bunch of adoptables and trade a bunch of stuff - luckily I've never sought out a dainty, but that doesn't mean this person wouldn't fabricate other slots of species I like.. oh my god. That's terrifying.